Here we go with Day #7 in the series on my brother. I had almost forgotten about how much my brother LOVED the movie Snow White and The Seven Dwarfes. My brother has a special place in his heart for this movie. Let me give you some examples to help you understand the depth of his devotion and how he incorporated it into his days. Picture this, in our childhood home there is a long living room. In the living room sits a piano (which my mother, a pianist, spent many hours accompanying us), on top of the piano is a light- that when turned upward and out created a perfect spotlight for countless hours of singing, dancing, and performing. From mock Star Search auditions, to impromptus (like a commercial jingle called “Sophia’s Fashions”), to Broadway ballads…this space has housed many a performance. So you see, the flair for the dramatic is alive and well in all of the four siblings. He used to (and still might) know all of the color combinations for each dwarf’s outfit…down to the color of their buttons. A friend of our family lovingly drew Brian a very realistic rendition of Snow White kissing one of the dwarfs. Apparently, it was not realistic enough because Brian let us know that the dwarf’s clothes and buttons were not the correct color (as in the movie). I also think Brian might have had a little big crush on Snow White. In May of 2005 Brian, his 13 month old niece (my Darling Daughter), and I took a trip to Disney World. Brian was turning 26 and completing his last year at a Young Adult Program (which concluded his public education), so he wanted to go on a class trip to Orlando. I wish I could record my brother saying Orlando- it has a lot of pep. So, I still can’t believe I did this, I volunteered to take Bri on his trip, along with my 13 month old daughter. We had a great time…and a highlight, of course, was meeting Snow White and telling her how fond my brother was of her. I couldn’t think of a better way to end this post than with a song from the movie (if you haven’t already, please pause/mute the music on the blog, so you can hear Snow White’s soprano voice soar with encouragement for us today). Deep Breaths: Who is someone in your life, or in this world, who inspires you? How do they specifically inspire you? Take 5 minutes and journal about this (or write the person a note). What is one character quality that this person possesses that you would like to emulate? How has God worked in their life to encourage you? Take a moment and thank God for the gift of hope in the midst of trying circumstances. 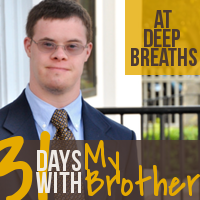 « 31 Days with My Brother: And then they were 4.